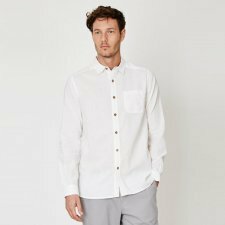 Our contemporary plain shirts in hemp and organic cotton are an essential solution for all wardrobes. Our men's hemp shirt features a button down placket, full length sleeves, and a classic shirt fit. Colours: white, navy or khaki. Made of 55% hemp and 45% organic cotton woven. 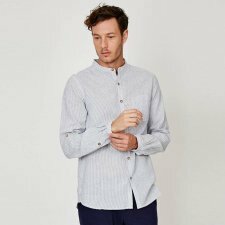 Henley long-sleeved shirt with buttons comfortable and soft on the skin with a slim fit. 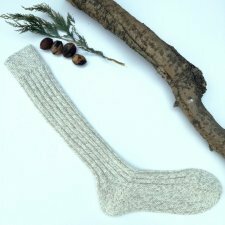 Knee high thick socks made of 65% undyed natural wool and 35% alpaca wool. Natural color melange / hazelnut. 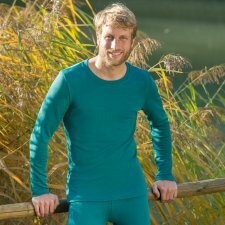 The organic wool of these long johns is not only comfortable and warm but also highly functional: It regulates humidity, keeps you warm and does not produce unpleasant odours. 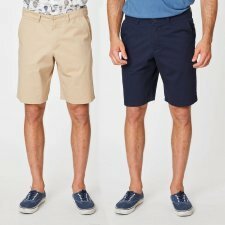 Sporty seams, with fly and flat elastic waistband. 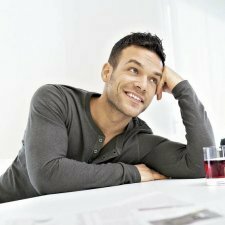 The functional long johns have a narrow cut and fit tight. With elastic waistband. 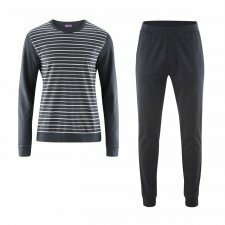 Our tip: Combined with the long-sleeved shirts they make a set that's perfect as natural functional clothing. Made of 55% organic wool and 45% organic cotton. Colour: sapphire blue melange. Fine rib 165 g/m2. Warming and skin-friendly functional shirt. Slim fit with extended back. Beautiful like a dream: These men's pyjamas from a mix of interlock and single jersey quality dress fashion-conscious men in a timeless and chic marine style: Without thunderstorm warning or distress but above all without nightly cooling. The top has subtle horizontal stripes on the front side, the elbows are blue on blue, reinforced by oval patches. The plain deep sea trousers are casually cut, come with welt pockets and implied fly. Warm and comfy fine rib cuffs all round. The long pyjamas for men stand out due to a timeless design and masculine colours. The striped long-sleeved shirt has a V-neck and a small breast patch pocket on the left side. 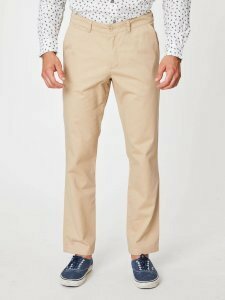 The trousers come with drawstring for comfortable width adjustment as well as broad cuffs at the ankles. The soft single jersey is made of 100 % organic cotton, 150 g / m². 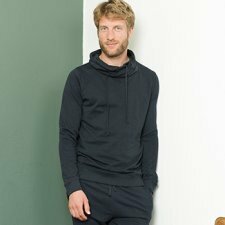 All functions for after-work hours: This casually cut relax sweatshirt from soft organic cotton sweat quality made of slub yarn is extra warm and dimensionally stable at the same time: That's how everyday heroes turn into after-work stars. 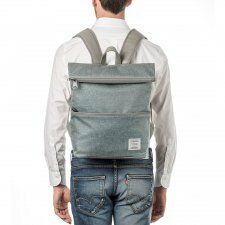 The drawstring integrated in the casual shawl collar gives it a sporty look. The cuffs at the wrists and the waist turn the top into casual and functional natural fashion. 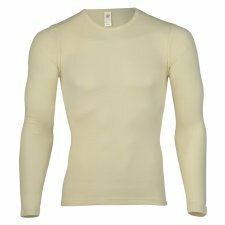 Superfine and extremely light, these garments make an ideal base layer, the first layer that is worn directly against the skin. These stretchy, high-performance base layer pieces won't wear out, and conform to every movement without constricting. Lightweight and yet cozy and warming, this material made from superfine merino wool and silk is exceptionally effective in supporting your skin functions by regulating body temperature and managing moisture. 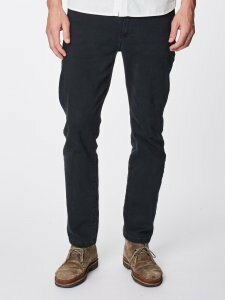 The new jeans for men in classic five-pocket style - produced vegan and fair! Comfortable fit with straight leg and a small amount of elastane. Slight wash-out effects complete the design of the jeans. Made of 99% organic cotton and 1% elastane.